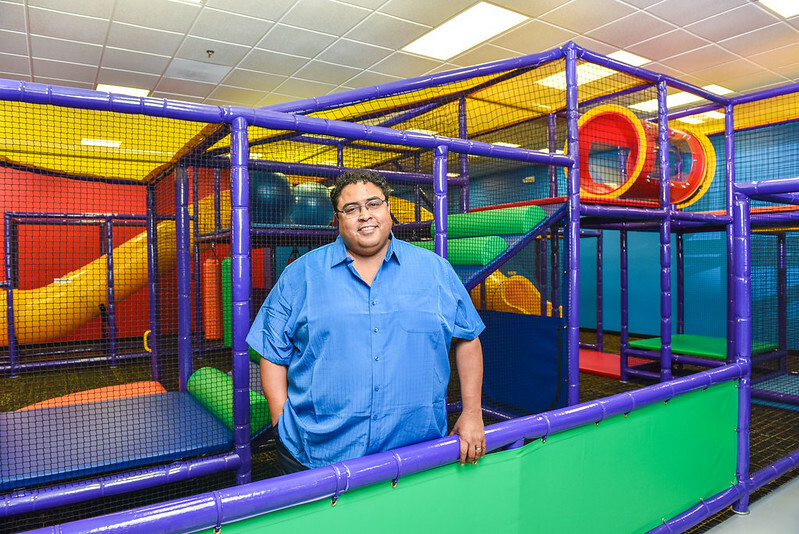 Meet Daniel Dorame, owner and founder of the newest indoor playground in Carpentersville, IL. As the regional multi-unit manager of more than 45 financial office locations in the Chicagoland area, Daniel Dorame had climbed the executive ladder nearly to the very top. He was experienced in property negotiations and management, and had opened 12 of those locations himself. But the role started to change, and suddenly more levels of leadership were added between him and the top. He realized he wasn’t going anywhere. After 16 years in the industry, Daniel decided it was time for a change. A big change, actually—he left his job and spent the summer at home with his two children. Each playground was different, but they all seemed to have similar restrictive policies and expensive add-on options. At one center he was turned away for holding a recently-purchased cup of coffee from Dunkin Donuts. The playground was fun for the kids, but the parents, Daniel included, weren’t having a good time. At the end of the summer, Daniel had seriously started thinking about opening his own indoor playground. He couldn’t find work back in the finance industry without making a huge out-of-state move, and his experience in property management provided a good foundation for the venture. He began to scout centers in and around Chicago. “We went all over the Chicagoland area, miles and miles, just to see how they operated. Not a single one of them would allow you to bring your own food, and the food they served was charged at restaurant price.” One place charged $14 for a sandwich. 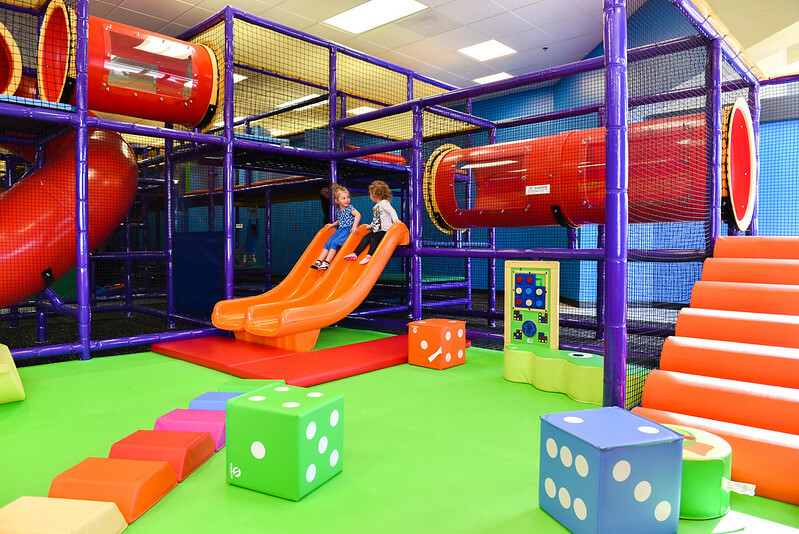 Daniel started putting together the concept of a new indoor playground, Tyke Play, in September of 2016. His #1 focus? The parents. “In my mind, the parent is the actual customer, because the parent pays you. When you build an indoor playground, you have to do an equal job of taking care of the parent as you do the child.” So he fixed that first. “When we developed Tyke Play, the precedent we set was a good, well-maintained playground and comfortable viewing area for the parents. We need to make sure the parents are comfortable when they’re watching the children. We have free WiFi for the parents, and we allow them to bring their own food, full meals or just snacks. The only thing we ask is they don’t bring anything with nuts, because we have to be concerned about the safety of all our children, but other than that they can bring whatever they like.” Tyke Play serves snacks too, for a dollar each. Their other services have easy-to-understand pricing, simple rules, and a welcoming environment. The center even plays familiar Disney music throughout the day. Pleasing the parents may sound easy, but starting the playground was harder than Daniel thought, even with his experience as a property manager. “I was used to very responsive landlords. 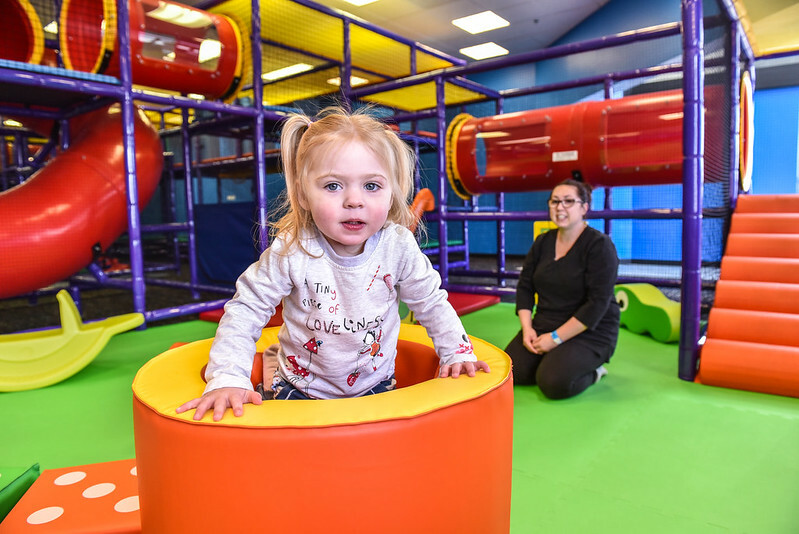 When I started out on my own with Tyke Play, for the first few months, I couldn’t even get anyone to talk to us.” He eventually connected with a landlord in Carpentersville who needed tenants, and the center’s location was set. On opening day, over 50 families showed up to celebrate and play with their children, all without any marketing or advertising. “We didn’t get our permit until the Friday before we opened. All these positive results we got from the community.” The visiting families even help to spread the news about the new playground. “My moms have been fantastic. They’ve done the marketing for us. I’m not even asking—this is from them offering.” Now, with almost twice as many kids per day than originally projected, and the real advertising starting soon, Daniel is excited with the results of his hard work, and looking forward to the future of Tyke Play and a successful small business in Carpentersville. Great story. It’s awesome you saw a need and filled the gap. I love how VEDC is reaching out to the communities.